Overall comment: Very unique steamboat experience; great for those who love fish & soup! Both HK Kitchen (downstairs) & Private Kitchen (upstairs) are owned by the same management, just with a slightly different concept; the former is more 'Hong Kong fast-food' style, while the latter is the steamboat & order-dishes style. p/s: They moved from Damansara Uptown to SS2. Wise move since parking at Uptown is madness! The deco along the stairway to Private Kitchen boasts of a nostalgic "back in those days in Hong Kong/the city" feel. It may be slightly challenging for those who are older to climb all the way up for a meal, but don't worry, you can also have your steamboat meal downstairs at HK Kitchen if you relate your request to the crew at the restaurant. You can also order sides of meat/seafood/vegetables (price range from RM1.00 - RM20.00/serving) to add into your steamboat. I guarantee that the soup will be even more flavorful at the end of the dinner! Oh, did I mention that this could feed 3 persons & more? On a side note, they're also introducing a new chicken dish, the Fragrant Spicy Chicken Pot (RM38.00/half chicken or RM68.00/whole chicken). You'll read more on my review below. The variety to feed 10 of us that evening! It's alike the Foochow Fish balls, but with sea urchin on the inside! Noms! Quite interesting. The texture is very alike fish roe, but softer. I enjoyed these pork balls, but I would much prefer it if it had "chor hao yue" (fried 'anchovies') added into the balls & have less flour added to the balls as well. If you're a big fan of pork, you will not want to miss this juicy piece of fatty meat! I prefer it thinner like those at shabu-shabu restaurants when it comes to steamboat, but if it's braised/fried such thick pieces of pork belly are best! I'm a big fan of mushrooms, so enoki mushrooms in the spicy/tomato soup are just thumbs up! Love the fragrantly grilled fish with the variety of vegetables (radish, cucumbers, big-head beansprouts, onions) & dried beancurd in the spicy soup base. Check out the load of chilies! Don't you just love the sight of ingredients floating around in the large 'steamboat pan'? This is certainly the kids'-friendly version. Many people love this version more than the spicy one as it's very unique. You'll rarely get tomatoes & sweet corn soup base elsewhere in Klang Valley/Malaysia for steamboat with grilled fish. It has a naturally sweet taste & is also very nutritious! Add the prawns & it'll be even sweeter! Very homey, smooth & tender - not over-powered by the heat from the ginger. We ended the warm night with this body-cooling dessert. The restaurant intends to add this item to their menu in the near future, so look out for it! 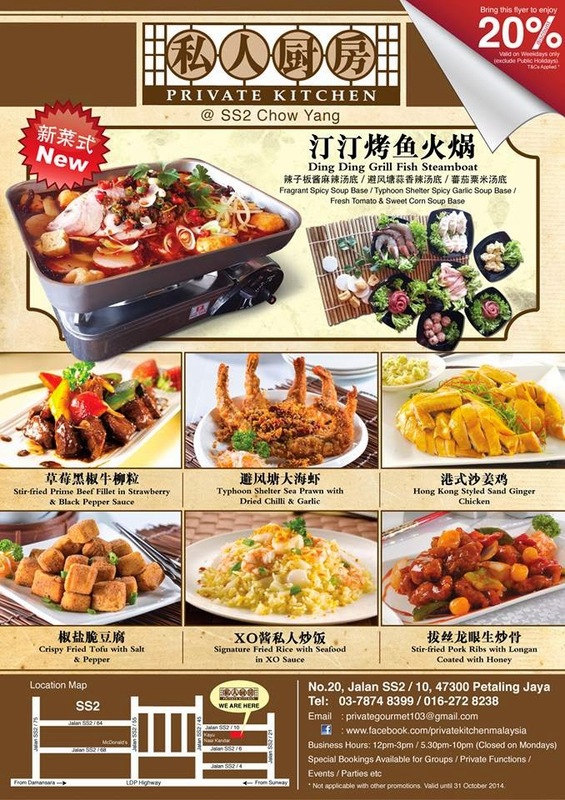 The Ding Ding Grilled Fish Steamboat is certainly something to try out. To reward all PerutBesi's readers, print out the 'brochure' below & get 20% off the following items! Enjoy! * Valid on weekdays only (exclude public holidays). * Not applicable with other promotions. Note: Chow Yang area, same row with Kayu Nasi Kandar.